Can ghosts teach us anything about the Reign of Terror? The Reign of Terror (1793-4) was an event of mass violence in the middle of the French Revolution. Tens of thousands of people were executed and hundreds of thousands were imprisoned. I study the aftermath of the Reign of Terror. I am interested in how the people who had lived through this event struggled to come to terms with it. In the course of my research, I came across a strange document, a pamphlet containing an exchange of letters between the living and the dead. 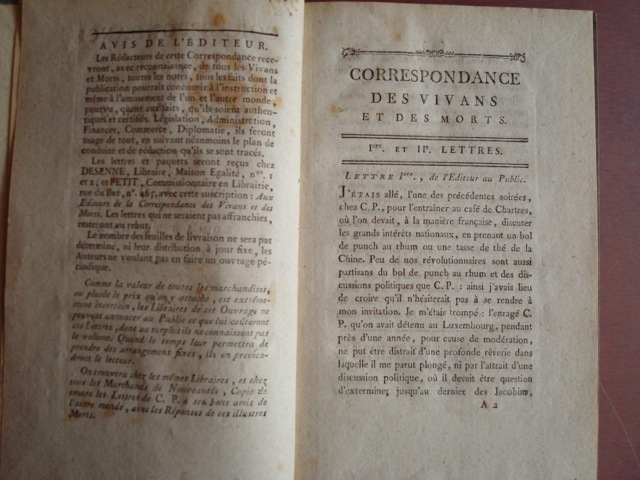 The pamphlet was published anonymously in 1795 and went through several editions. It tells the story of a correspondence between two friends who had been in prison together during the Reign of Terror. In prison, they had promised each other that, should they to survive, they would devote their lives to persecuting those who arrested them and to telling the world about their misfortune. One of them survived, but the other was guillotined. One day, about a year after the end of the Terror, the friend who had been killed appeared in the dream of the survivor. He said that although he was dead, he was still intent on keeping the promise that they had made to each other in prison. When the friend awoke from his sleep, he found strange sheets of paper on his desk. What made them strange is that the writing on them appeared to be mobile, quivering, as if the lines on the page were alive. It turns out that these were letters sent from the netherworld. The two friends embarked on a correspondence between the living and the dead, in which they discussed politics, the events of the French Revolution, and also gossiped about celebrities. So what should we make of this strange story? Well, ghosts are interesting because they embody a past that has not passed. Normally we think of time in a linear fashion: past – present – future. Ghosts disrupt this linear sense of time. They are the return of what should have been gone forever. This is captured very well in the French term for ghosts, revenants, meaning those who have come back. I think that’s what makes them so scary and also fascinating. One doesn’t need to believe in ghosts to see that this document teaches us something valuable about the period: it shows us how those who had lived through the Terror expressed the notion that they were haunted (literally!) by the terrible events they experienced. Ghosts gave them a way to talk about a difficult past, a past that continued to reverberate in the present. This popular pamphlet was not the only appearance of ghosts in the immediate aftermath of the Reign of Terror. 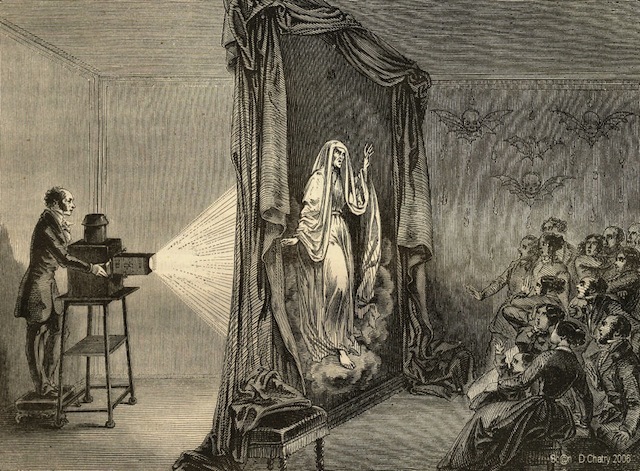 In 1797, three years after the Terror, a man of science by the name of Étienne-Gaspard Robert invented a machine for the projection of moving images, which he called the phantasmagoria. The word is composed of the Greek fantasma, meaning ghost, and agora, the public meeting place in the city-states of ancient Greece. So the word phantasmagoria means something like a gathering of specters. 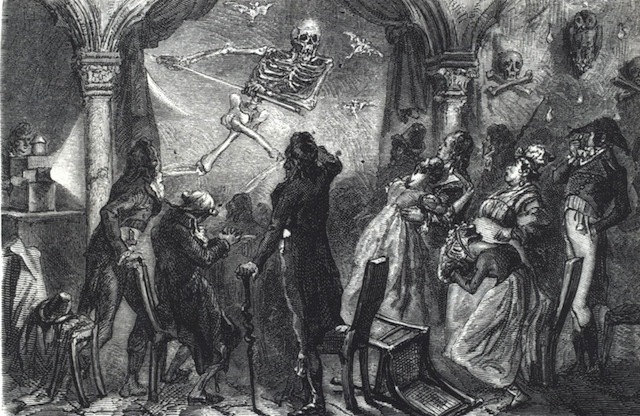 The shows of the phantasmagoria consisted in the projection of images of ghosts rising from the dead, usually to the accompaniment of the eerie sounds of the glass harmonica, a musical instrument that was invented by Benjamin Franklin and that was thought to have curious effects on the nerves of listeners. French artist Thomas Bloch, exhibiting the glass harmonica in the Paris Music Museum, Nov. 29, 2007. In short, the phantasmagoria was a kind of 18th century horror show that appeared in Paris immediately after the Terror. Indeed, many of the images that Robert created for the show were of victims of the Terror or other celebrated figures from the French Revolution. Eventually, the police shut down the shows because it found them to be seditious. So in this case, ghosts were used in order to talk about a past that was politically delicate, perhaps even forbidden to talk about. This is an interesting detail because it is counter-intuitive. For most of us, I think, the closer we are to a text, the easier it is to read it. But here, proximity makes the text unintelligible and distance makes it legible. I interpret this detail in the following way: the letters of the dead are bearers of traumatic knowledge. This is impossible knowledge, which cannot be grasped when one is too close to the events at hand. This knowledge only becomes accessible from a distance, the distance of time rather than of space. So ghosts give us access to the manner in which men and women in the late eighteenth century processed difficult pasts, pasts marked by brutality and massive repression. It turns out that they have a lot to teach us about the Reign of Terror. Bwahahahaha!